I recently read an article from AFA (American Family Association) Journal titled, The Word…power in your pocket, by Randall Murphree. The article is written to emphasize the importance of getting God’s Word into the hearts and minds of our children on a daily basis. My journal entry is not to replicate the article, but to direct parents primarily, and church leaders to the website where they can receive “free” downloadable Pocket Scriptures. Pocket Scriptures were created by Charles White, the project facilitator of Christian Child Care Coalition, Topeka, KS. Pocket Scriptures are written Bible verses on strips of paper that can be printed from this website: http://www.bibleparent.com. 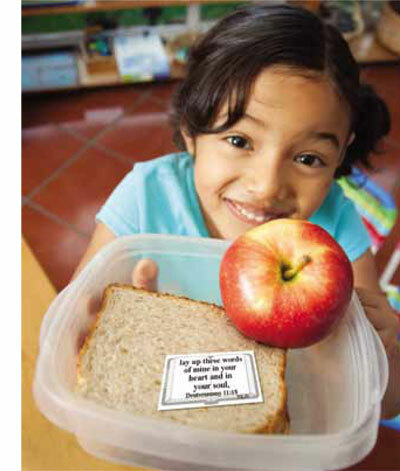 After printing and cutting out the Bible verses, parents may stick a verse a day into their child’s pocket, lunch box, or on their pillow at night, etc. Not only is this a great way to remind children that Jesus is always with them, it also gives the Holy Spirit an opportunity to work in their child’s life. White resolutely believes that it is the parents’ responsibility to make sure the Bible becomes an integral part of their children’s lives. I wholeheartily agree! In addition to Pocket Scriptures, the Bible Parent website offers other resources –coloring pages, parent guides, bulletin inserts and other creative suggestions adults will find helpful in teaching children God’s Word. Here are some inspiring and fun ways for families to learn and study God’s Word. • Over Sunday lunch, talk about the Bible verses your children brought home from Sunday school. • Explain to your children that God gave us the Bible to help us know Him better and to trust His love. • Tuck a verse or two in your pocket, then let your children see you using them. • When you pray with your child ask God, through the Holy Spirit, to help you rightly understand and apply His Word. • In your daily life, look for opportunities to share with your child passages that you are studying and that are helping you to grow in Christ. • Make a flip calendar for your child’s room that includes Bible verses. • Make a plaque with an appropriate verse near an entrance that your child often uses. • Display a verse on the dashboard of your car. • Be ready to use Scripture passages to comfort, correct and encourage your children. • Put a bowl of verses on your dining table. Take turns pulling out a verse and reading it aloud. • Prepare a Bible trivia game for long trips in the car. • If you are a single parent, tell other adults in your child’s life about your efforts to keep the Scripture in front of your child daily. Ask for their support.